I have been fortunate in my life to have been part of many cooperative art studio spaces. Trained as a printmaker, I have spent many post-academic years developing my skills in a working environment surrounded by fellow printmakers. These artists and technicians have helped me tremendously over the years, not only through technical support, but also collaboration and mutual admiration. When I became a mother four years ago, I knew the challenges of maintaining my studio practice would be significant. During that time, my family and I were given an opportunity to relocate to Santa Cruz, a beach town set along the central coast of California. 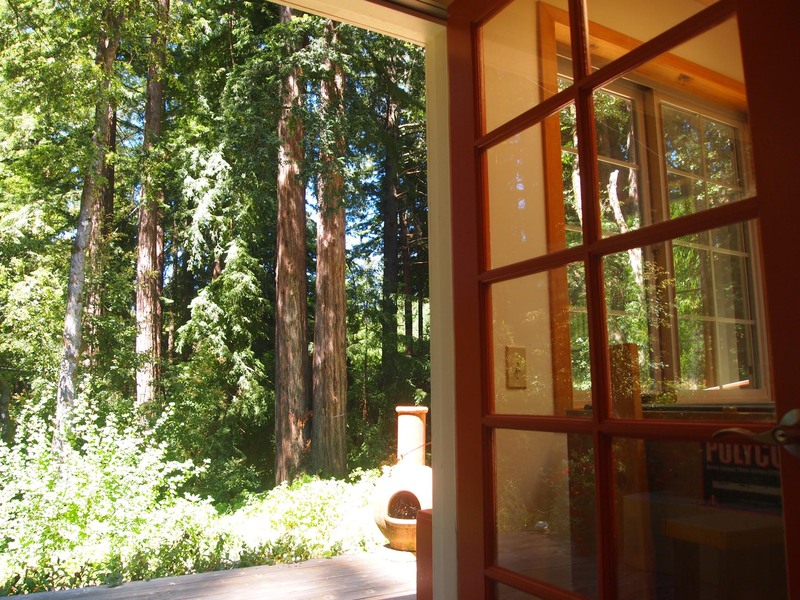 Santa Cruz is rich in natural beauty and is known for its strong arts community. These strong art ties made it relatively easy to find places to buy or rent that came with detached art studios. I immediately knew this type of workshop/home set up was the most ideal for me. We were lucky to find such a place to rent initially, and eventually buy. We refer to our homestead as “the compound”. With 3 buildings- the main house, art studio, and studio apartment, I am able to work in a 500+ sq ft building just a staircase away from the main living house. This set-up, although ideal now, came with some challenges, mainly to transform the current space from a ceramic studio into a printing studio. After six months of Craigslist- hunting and several weekends of DIY, we managed to turn the space into my current workshop/art studio. My work has always been influenced by the natural world, to some degree. Although I approach my work in more of a conceptual format – rather than representational -, having natural beauty as a backdrop while I work has given me endless inspiration for investigating the many complex structural systems found in both natural and human landscapes. I begin with making stencils (drawing, painting, photographs) that eventually become printed layers that make up my images. The transparency of the film allows me to get a good idea of how the individual layers will work together, of colour choices, and of the actual order used to create the desired effect. This vacuum table and separate light integrator system uses UV light to transfer my images to the screens with extreme precision. This photo-silkscreen process allows my ideas to be made into a reality by turning them into workable stencils. 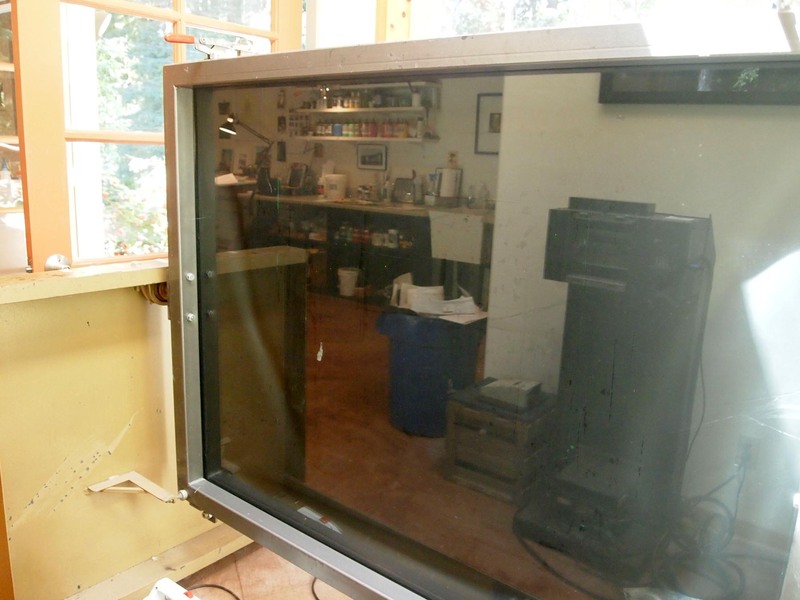 I use mainly 30” x 40” metal frame, pre-stretched screens with 305 mesh. These screens are relatively affordable and have a high enough mesh count to allow for small dot work, which creates tighter, more detailed images when printed. They also are light and easy to manage, while still being big enough for decent size images or several small stencils together. 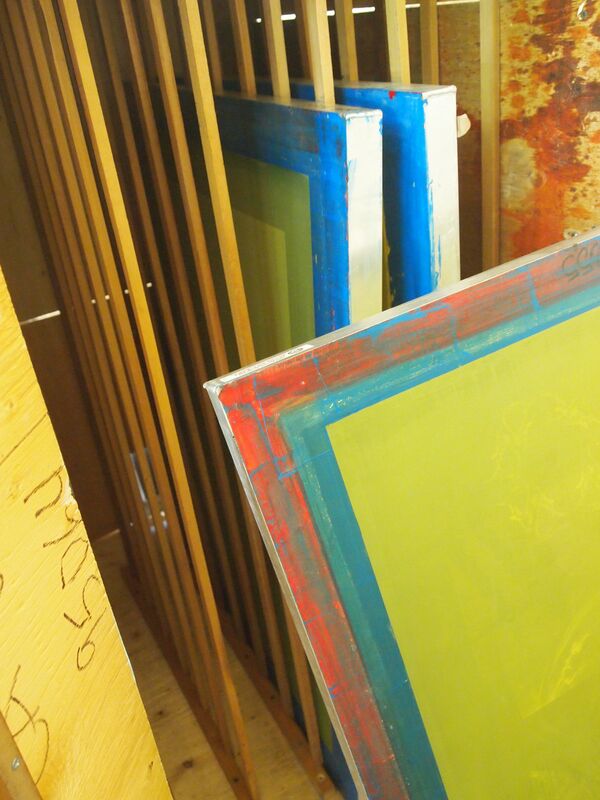 I use the water-based screen-printing system (water-based inks, emulsion, etc.). This system makes everything low toxic and easy to clean. In setting up my studio space, I came across the Enviro line of products. 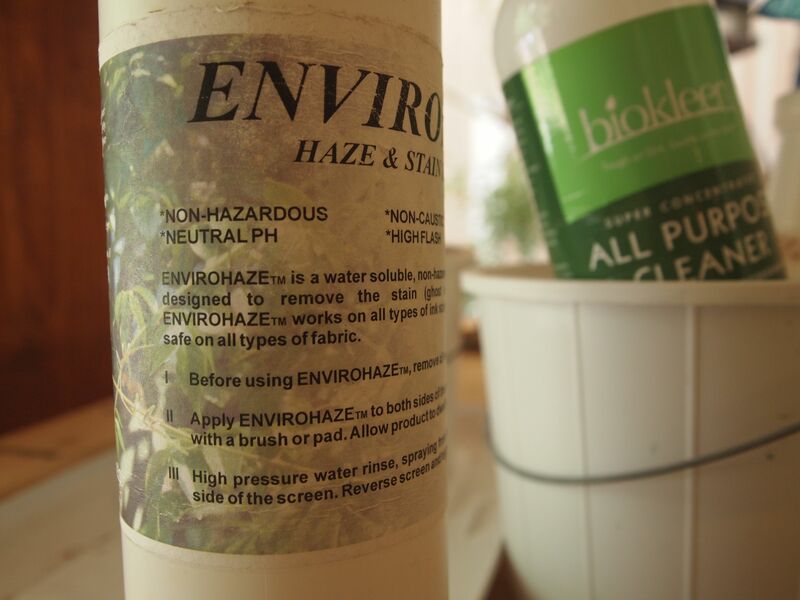 These chemicals clean my screens beautifully, while being non-hazardous both to my health as well as to the environment- everything is biodegradable. 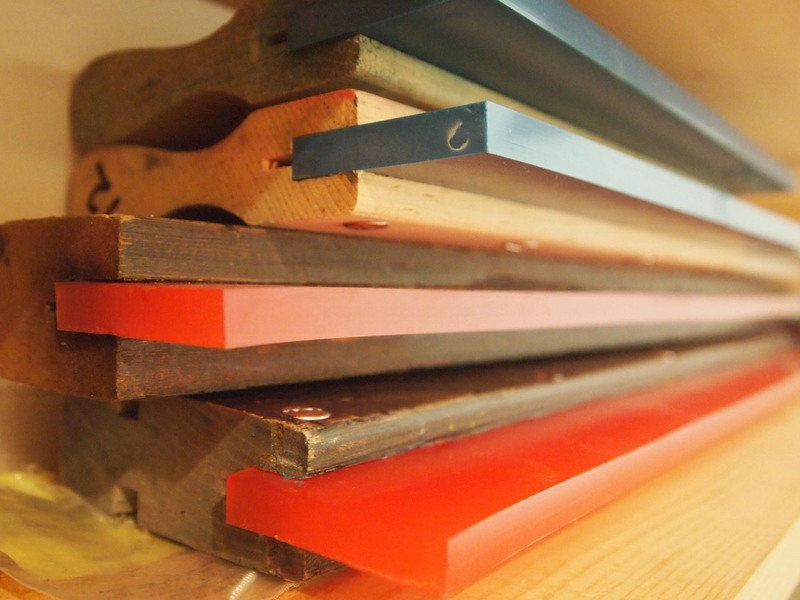 My paintbrushes, essentially, are rubber blades held in wooden handles, called squeegees. It is essential to take very good care of these; one knick and you’ll print an unwanted line in your work. For close to ten years now my main subject matter has been light. Capturing the physical nature of light through colour is tricky, and even the subtlest change creates an entirely different effect. 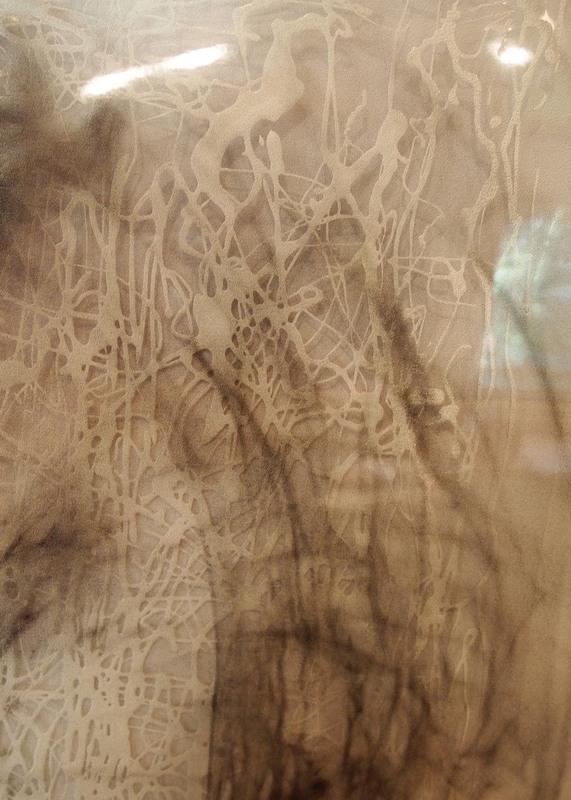 For that reason, I slowly build up my prints using many layers of translucent or semi-transparent ink mixtures. This creates a richness that still feels light. The inks I use are Lascaux Studio Acrylics, which are expensive, but in my opinion are the richest and nicest screen inks for water-based. I’m really inspired by colour, and love to think in contrasts. I also include metallic and interference inks to create a shimmer effect that connects back to my subject matter of light. I use a Cincinnati One-arm manual vacuum press for printing my screens. This press allows me to work relatively large with precise printing results. The photo images that I print are made up of many small dots and having a vacuum press allows me to print many layers with accurate registration. 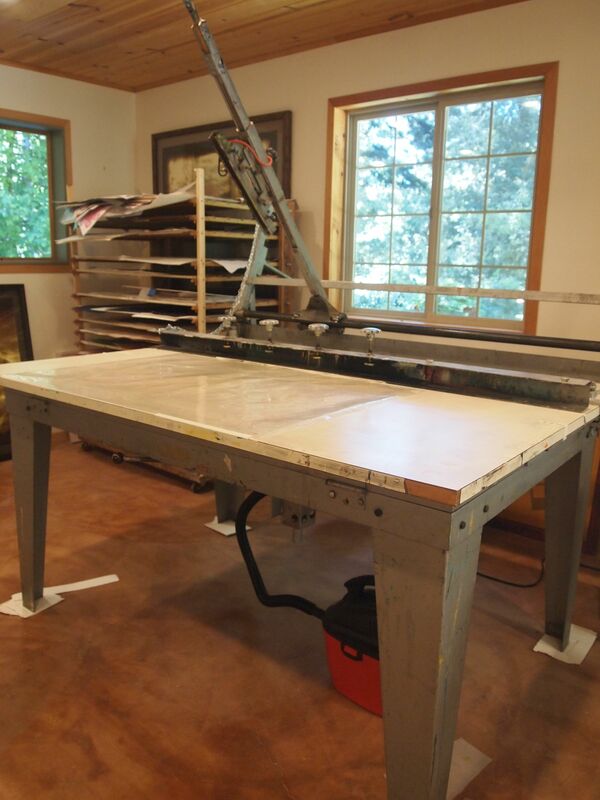 Because of its size, 60” x 70”, the press is also great as a planning table. 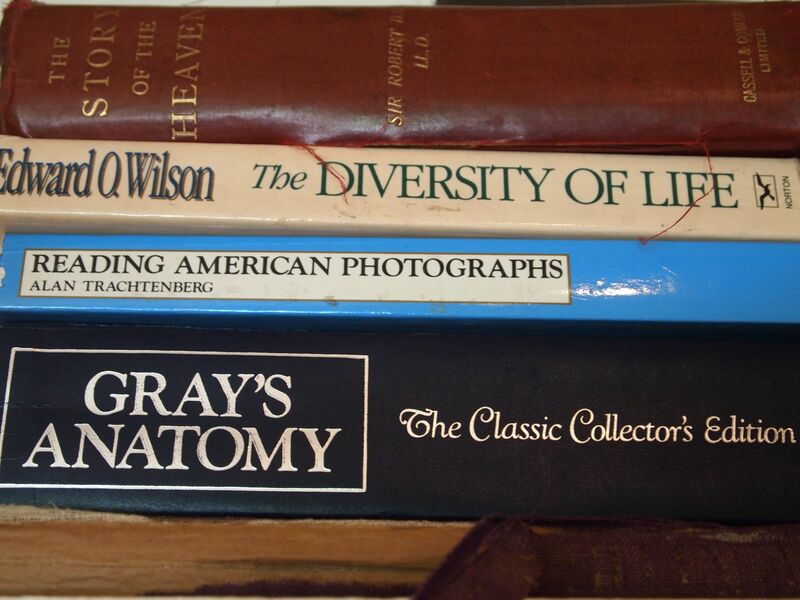 Many of my titles for my pieces come from phrases, diagrams or figures from one of these books. I approach much of my work as an interdisciplinary piece and/or project and I am always amazed at the crossover and connection within the life sciences. 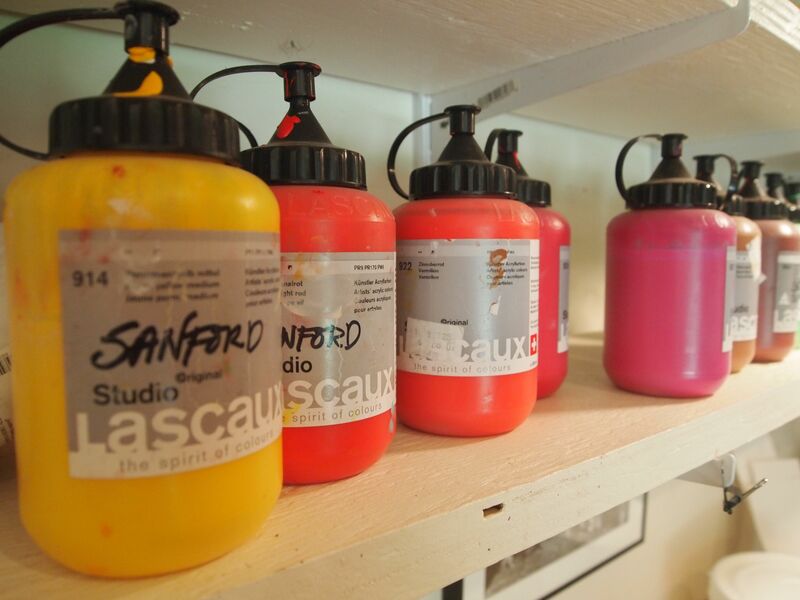 Sarah Sanford is an artist-printmaker who has exhibited her work both nationally and internationally. She combines photography and drawing with printmaking to create abstract images reminiscent of forms present in the natural world. 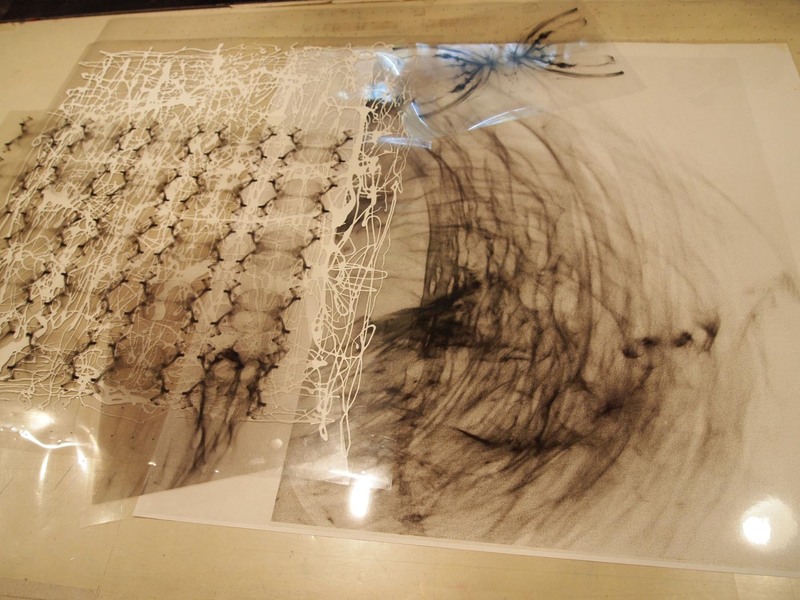 Her recent work of multi-layered screenprints investigates the ephemeral qualities of light and glass. She is currently showing The Aberration of Light at the Michaelangelo Gallery in Santa Cruz, CA. See more of her work here.